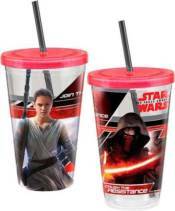 Star Wars: Episode VII - The Force Awakens is the inspiration for this black Star Wars Episode VII 18 oz. Acrylic Travel Cup featuring the film's logo, a lid, and a straw. Hand wash only. Not dishwasher safe. Do not microwave. Measures approximately 6-inches tall. Ages 8 and up.